1978 topps is my favorite set ever. mostly for sentimental reasons, but i do really like the design. 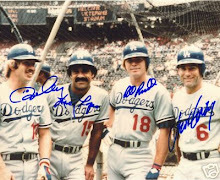 most of the dodgers from that year are still around, and i have enjoyed my limited foray into the world of through the mail autographs, so i decided to try to complete a team autographed set. i will try to do it primarily ttm, but i may hit up ebay if there is a roadblock with a certain player. for glenn burke and johnny oates, ebay is going to be the only likely source for me. i already have a steve garvey autographed 78 topps, but that's with my garvey collection, so i will be sending another one his way. here's a list of the players included in the team set. wish me luck. and if you know someone who has a glenn burke auto, please let me know! and joe sambito hanging out at the field level scoreboard. i liked the sambito card so much, i sent a double to him for his autograph. more manny, thanks to mario. 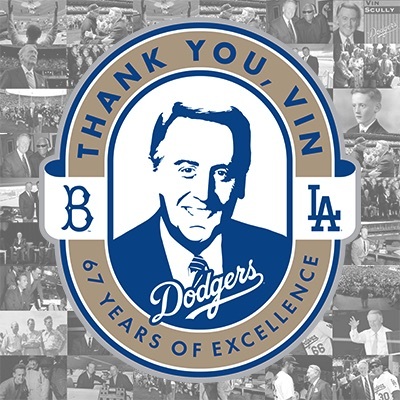 at least it's not the same background used for most of the other dodgers. 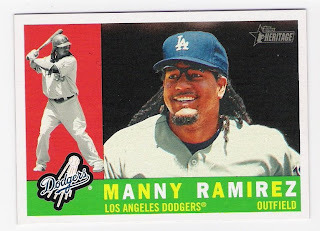 of course, those were from spring training 2008, so manny would have still been in fort myers with the red sox. 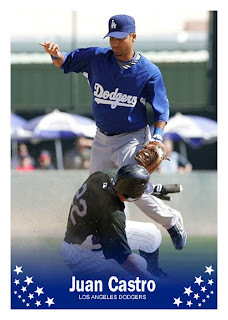 i got excited by topps chrome last year, simply because they didn't always use the same photo. exact parallels are kind of useless. the 'look ma, no legs' set. ud is very lazy with the photo selection here. thanks mario! hope you enjoyed 'card sharks'! traded sets contest winnings! if i can do it, so can you! andy over at traded sets started a new, weekly contest. it's pretty easy to enter - just pick the winning pitcher and one player who will go yard for each of 3 games he chooses. if you win, you get some cards of your favorite team or something along those lines, but if all of your picks are correct, you also win the jackpot. so far, the jackpot contains a 1988 score traded set, two packs of 2009 topps heritage, and 6 packs of 2009 upper deck. not too bad. to win takes careful study of player tendencies, weather, and a ridiculous amount of luck. i got lucky in week 1, and here's what i received. 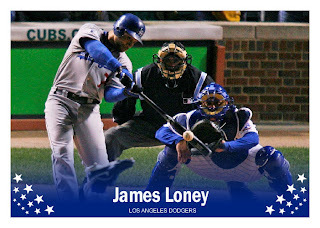 2009 topps heritage chrome james loney. a chroney, as andy calls it. 2009 upper deck clayton kershaw. our answer to the giants' tim lincecum. but we also have chad billingsley. so there. 2009 upper deck rafael furcal. suddenly the dean of the dodger infield. 2009 upper deck blake dewitt. this card has a 1973 topps appeal to me for some reason. 2008 topps andruw jones. 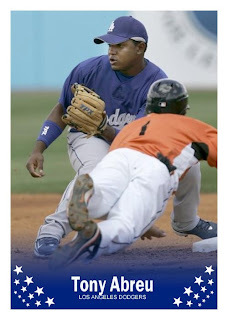 not only was he a bust, but this card is the worst dodger photoshop job by topps since, well, the 2007 juan pierre card. thanks andy! i'm coming for that jackpot! a couple of non-dodger through the mail successes! roy howell and his 1978 opc card and a 1968 jim lonborg world series and 1969 topps card. i grew up very aware of these two guys, and even met howell a couple of times in the off season. they were from my neck of the woods, although i don't know how long lonborg lived on the central coast - he's now a practicing dentist in massachusetts. they both returned the cards in just 7 days. this card. the champs celebrate. i don't know who is getting doused with booze - no dodger is listed as 33 at baseball-almanac but it could be joe becker, one of the coaches. anyone know for sure? thanks adam. 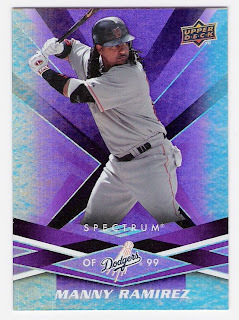 let me know if you have more dodgers to unload for sox! ok, so it's not albatross, but take a look at these cardinals from 1998.
first, willie mcgee on his 1998 upper deck collector's choice card. next, dmitri young on his 1998 donruss card. both of these guys look like they have some extra bats to hawk. maybe they're mcgwire's bats. at least they are open about what they're doing, unlike ruben rivera and his attempt to sell derek jeter's stuff. padrographs package - a well balanced meal! this has taken me far too long to post. sorry about that, rod. rod at padrographs sent me a fantastic, well balanced package a while back. he hit the five main collecting groups - garvey, dodgers, double plays, dodger stadium backgrounds, and plays at the plate, with even a final tribute for good measure. i love receiving any of these types of cards, but rod really put some thought into it. enough of that, let's see some cards! 1987 donruss barry bonds a dodger stadium background. and an auto! wowza. nice hat, too. 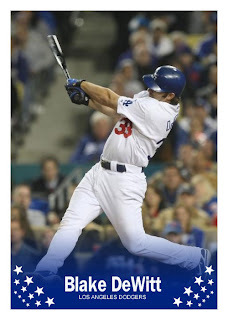 in his first full series in the majors, the dodgers held bonds to 1 hit in 10 at-bats, and struck him out 5 times. of course, they also walked him 5 times. i remember bobby bonds being in the booth with vin scully or ross porter at one point during the series and being deservingly proud of his son. 1987 donruss barry larkin another dodger stadium shot of a former nl mvp. i spent many a game out there in the pavilion. good good times. 1995 topps craig shipley the aussie turns two. craig began his career with the dodgers, and was involved in that 12-player deal that sent ken caminiti to the padres in 1994, setting up that great finish to the 1996 season where they swept the dodgers to win the nl west by one game. of course, the dodgers won the wild card and both teams were swept in the first round anyway. 1989 topps padres leaders here's the play at the plate. 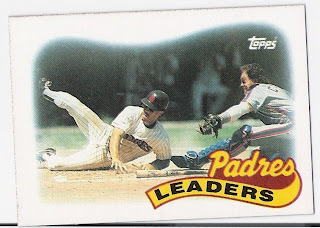 nice that gary carter, a met, is more recognizable on the padres leaders card than the padre shown. why not just have a smiling tony gwynn photo and be done with it? 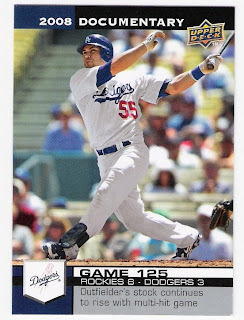 2009 upper deck russell martin nice. 2008 upper deck documentary russell martin nice, but documentary still sucked. and a ton of garveys. sure, they were padres garveys, but that's ok.
1987 fleer mini steve garvey you can shrink steve garvey, but you can't defeat him. 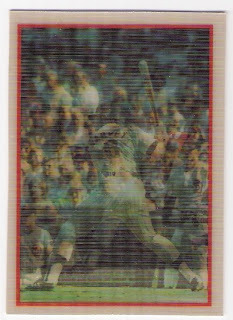 1987 sportflics steve garvey these cards don't scan well at all. but you get the idea. the final tribute was garvey's 1988 score, which i have posted before, so i won't show it again here, even though it's a favorite of mine. rod - thanks for taking the time and putting together such a great package! oisk! through the mail success! this ttm stuff is pretty cool. carl 'oisk' erskine returned the two cards i sent him in about a week, and he added his own card - personalized! erskine started and won the first regular season game the dodgers played in los angeles. he also threw two no-hitters, won 122 games, and struck out a record 14 yankees in a 1953 world series game. erskine, along with sandy koufax and don newcombe, threw out the first pitch at the dodgers' home opener last year, celebrating their 50th year in l.a.
here's a 2005 topps 'dem bums' insert. it had the facsimilie auto, and carl added the real deal diagonally. i really like that the full body shot is of him running the bases with a somewhat panicked look on his face. this is the same issue i had duke snider sign earlier. 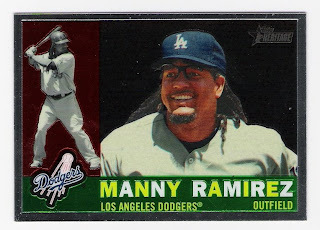 i might try to get all the dodgers from this set - at least those that are still around. it's a good looking set and looks nicely signed. it appears that erskine started with a black pen and went to blue. 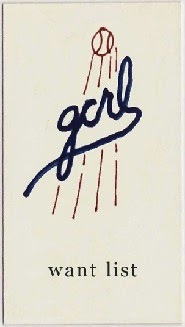 here's the custom card erskine provided. the back touts his career accomplishments, along with a sports rehabilitation center he is affiliated with in indiana. orlando hudson's cycle got me to post his card already, but here is the rest of the dodgers' infield in their 2009 goose joak originals glory. playing first base, number 7, james loney. a nice centerfield shot of his nlds grand slam. at shortstop, number 15, rafael furcal. i was really hoping ned would re-sign furcal. 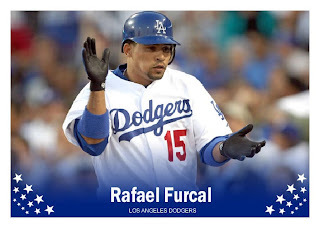 now i hope furcal stays healthy. at third base, number 23, casey blake. last year, blake was wearing number 30. this year, hudson wore 30 once or twice. now, nobody's wearing it. makes me wonder if there's something going on with maury wills, even though the dodgers are notorious for not retiring numbers unless it's for a hall-of-famer (jim gilliam being the only exception). now for some of the backup infielders. the theme this year is versatility. all of these guys can play just about any of the infield positions. even the injured doug mientkiewicz can play first and third. blake dewitt. dewitt can play second or third, and even short, and we will probably need him in all spots before the season is through. 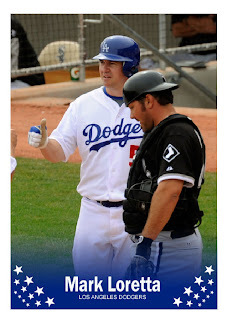 his second tour of duty with the dodgers. great glove - only 65 errors in his career playing all infield positions, except for one game in the outfield. he's already shown up at first, second and third. abreu saw a good amount of action in 2007 at second, third, and short, but is still waiting for another shot. in 1973, topps did not issue a card for jim lefebvre, which disappointed me as i began collecting the dodgers team sets for each year. 1972 was lefebvre's final season - his eighth, all as a dodger. i have mentioned before that lefebvre was my dad's favorite player, so i have a certain affinity towards him. now, thanks to modern technology, here is jim lefebvre's final tribute. the 1965 rookie of the year, lefebvre had perhaps his best season in 1966 with 24 homeruns and an ops of .793. he was selected to the all-star team and finished 18th in the mvp voting that year. the dodgers appeared in their second straight world series, and although they were swept by the orioles, it wasn't too bad of a start for lefebvre's career. after a comparatively down year in 1967, lefebvre's playing time diminished in 1968 as he missed all of may and most of june, assumedly to an injury. with the arrival of the dodgers' heralded 1968 draft class in the early 70s, i imagine his playing time was limited more and more. lefebvre made his final appearance on september 19, 1972 as a pinch-hitter, striking out against mike corkins. he finished with a career batting average of .251.
like some of his dodger teammates, jim appeared on television, including guest spots on 'gilligan's island' and 'batman'. he went on to manage the mariners, cubs, and brewers, as well as the chinese national team, and he is currently the hitting coach for the san diego padres. 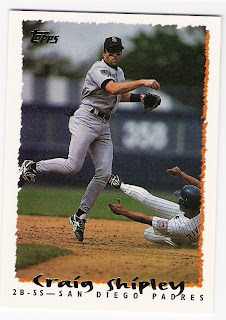 1991 topps jose gonzalez it's really billy bean. not beane. 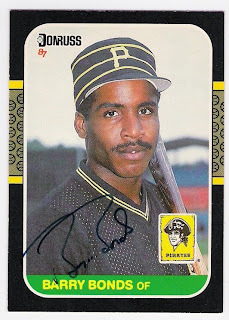 topps had a few of these types of corrected errors in 1991. curious. 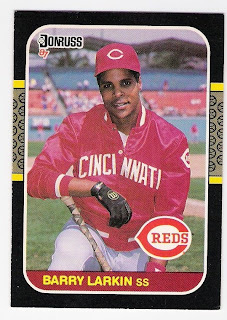 1991 topps stadium club jose gonzalez here's what jose really looks like. 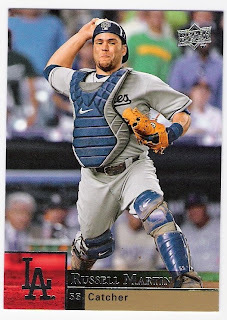 2006 fleer ultra cesar izturis usually these pac bell/chevron cars shots are reserved for oh my omar! 1998 leaf eddie murray a final tribute! ed-die finished his career in 1997 with a second go around as a dodger. final stats: 3255 hits, 504 homeruns, 1917 rbi, 0 interviews. 1992 leaf todd benzinger intense! these next two are awesome. 1996 upper deck roberto kelly celebrating his vagabond ways - from the expos to the dodgers to the twins. technically, this is a twins card, but so what. it's a dodger sandwich. again, a dodger sandwich on what is really an indians card. not bad from an indians fan. a while back, captain canuck posted a lament about finding 1971 o-pee-chee cards. at that time, i had exactly two in my collection - al downing and duke sims, both of whom were "recently traded to dodgers". 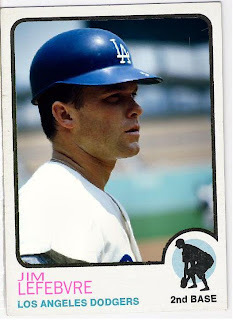 there is another dodger variation in the set - alan foster, who was traded from the dodgers to the indians. now, if you have read this site before, you may know how much i like these o-pee-chee variations. so, i asked brian if he had a double of foster - he did not, but he offered to send it to me anyway. well, i received it the other day, and, like the game of ball, it is glorious. side note number one: a reader contacted me a while back looking for information on 1971 o-pee-chee variations, which got me thinking, maybe i should go for all 13 variations, not just the dodger related ones. so, i have added them to my want list, minus some i found a couple weekends ago. side note number two: i found out last night that i am a canadian citizen, thanks to yesterday's amendment to the canadian citizenship act, so these o-pee-chee cards are even better, eh? kurt stillwell. a double play! stillwell must have the highest double play photo to card ratio of any player ever. stan belinda. 1958 world series sportflic thingy. alejandro pena. as a met. 1991 fleer. avert your eyes. bo jackson. bo knows junk wax. mike marshall. as a red sock.the mets kept him for only half a season. kirk mccaskill. the pride of kapuskasing ontario. bert blyleven. i'll show this one since it's not dandelion yellow. rich garces. el guapo. dennis cook. loogy. as in 'lefty one out guy'. mike simms. 1989 score. this was a grocery pack. keep that in mind. larry sheets. what was he on in 1987? tony gwynn. i used to love going down to san diego to see the padres play the dodgers. i secretly rooted for tony gwynn, even in those games. rafael ramirez. paul zuvella. turning two! dave meads. in dodger stadium! rich gedman. craig biggio. i guess i'll show it the second time around. goose gossage. ditto. manny lee. sorry manny. you'll have to show up 5 or 6 times before i bother. orel hershiser. 23-8. 15 complete games. singing hymns on the tonight show. doug jennings. jose rijo. in dodger stadium. mike 'enough' aldrete. once bought beer for me and my friends. dave leiper. terry puhl. the pride of melville saskatchewan. terry mcgriff. tom lasorda. pre-slimfast. frank viola (all star). allan anderson. i believe he skipped a start to ensure that he would lead the league in era. cecilio guante. the legend continues! denny walling. men are from mars, women are from venus, denny walling is from neptune (nj). dave eiland. i show this only because topps gave him a card after making only 3 starts for the yankees, but didn't bother with a regular issue card for don sutton (they did give him a box bottom card). thanks captain. that was a lot of fun. houston, topps had a problem in the 60s! fernandomania! through the mail success! does anyone want any diamondbacks cards?